Now all the tax collectors and sinners were coming near to listen to him. And the Pharisees and the scribes were grumbling and saying, “This fellow welcomes sinners and eats with them.” So he told them this parable: “Which one of you, having a hundred sheep and losing one of them, does not leave the ninety-nine in the wilderness and go after the one that is lost until he finds it? When he has found it, he lays it on his shoulders and rejoices. And when he comes home, he calls together his friends and neighbors, saying to them, ‘Rejoice with me, for I have found my sheep that was lost.’ Just so, I tell you, there will be more joy in heaven over one sinner who repents than over ninety-nine righteous persons who need no repentance. Or what woman having ten silver coins, if she loses one of them, does not light a lamp, sweep the house, and search carefully until she finds it? When she has found it, she calls together her friends and neighbors, saying, ‘Rejoice with me, for I have found the coin that I had lost.’ Just so, I tell you, there is joy in the presence of the angels of God over one sinner who repents. How wonderful that song is, “Turn your eyes upon Jesus and the things of the earth shall grow strangely dim. Turn your eyes upon Jesus, you’ll find glory in the light of Jesus Christ.” More than anything else, Jesus showed humanity who God is like. He did a lot of things, but he clearly showed us who God is like. We can create all kinds of images of God because God is invisible. So you can create images and you can create concepts. You can call him immortal or immutable God or all presence or omniscient God, you can talk about everything about God. But the God that we believe, the God that we worship is God, whom Jesus revealed to us. Throughout his life, Jesus showed us manifestation. Who is that God whom we worship? Today there are three stories, and we read only two stories. The first story is about a shepherd going out, looking for searching for the lost sheep. The second story is about a woman who’s searching for Drachmas, a coin worth the price of a lamb. The third story we didn’t read is about a father who is waiting and searching for his lost son, the prodigal son. So through these three stories, Jesus showed us who God is like. Our God actively searches for the lost, that is who God is. Our God is not an indifferent bystander. God is not just up there in heaven and just observing what we’re doing and coming down to punish us when we make mistakes. That is not the kind of God that we know and worship. Our God is very much engaged in our lives and is with us experiencing all the things that we experience every day, the reincarnation, and Jesus coming down to Earth. That is exactly what God looks like. Instead of staying up there in heaven, he came down to be with us even though it is muddy. He didn’t mind to be put in a muddy situation and he stayed with us and ultimately he was crucified. 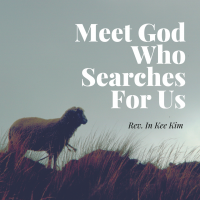 That is the kind of God that Jesus showed us, a God who is searching for us. There’s one person who found the secret about of God even before Jesus came, and that was King David. He said this in Psalm 1:39, “Oh Lord you have searched me and known me.” He knew what kind of God he was worshiping. He knew that the God that we worship is one who searches and searches him, and then he went on to say that later, “where can I go from your spirit or where can I flee from your presence? If I ascend to heaven, you’re there. If I make my bed in Sheol you’re there. If I take the wings of the morning and dwell in the utmost parts of the sea, even there, your hand shall lead me and your right hand shall hold me fast.” David knew God was right there in his life. That’s why he could write such a beautiful poem like this, this image of the searching God. When I look at it, I see deep compassion and love of God. An angry or caring God? Sometimes we see an angry God in the Old Testament, a God who is so frustrated with us, ready to punish us. God is so frustrated in the Old Testament, so you think that God is an angry God, but that’s how the old people and Asian people express who God is. But what they are trying to express is that God is very concerned about us, that God cares for us. If you don’t care about anybody, you don’t even get angry. Only when you care for somebody you can get angry, so he shows how much God cares for us. Of course, he’s frustrated, but he deeply cares. He’s never indifferent to us, so whenever we go astray, he gets so frustrated, “why do you keep going that way.” He was expressing a kind of angry manner because that’s how ancient writers wrote it, but you see the God who deeply cares for us. The woman searched all night for the lost coin and the shepherd went through the whole field, crossing the river and climbing the mountains to search for one lost sheep because they cared. God is always searching for us because God cares. Sometimes my friends, we fall away from God. We’re so distant from God, not necessarily because we hate God or we rebel against God, but sometimes we just get drifted away. We don’t feel very close to God. Maybe life is too busy or raising family is too difficult or we get carried away with our own ambition or we get distracted by life’s temptations. Slowly we get drifted away from God. We become dry and we lose touch with God, there’s no real connection with God. Prayer becomes just language and the word of God does not penetrate into our soul. It does not touch our soul, so God is there, but he’s just there. We are not connected with God. When life’s tragedy hits us, we feel so lost that we don’t even know what to do and we get really scared too. When we are drifted away or hit by life’s tragedies, we feel distant from God. We feel that God is far from us, but that’s just how you feel. God is never distant from us. We may feel very distant from God, but God is never distant from us. God is always there actively searching for us. God is waiting for us to turn around. When I feel that God is far away, that’s when God is closest. I may feel that, but God is right there because we need God. When I’m at the lowest point of my life, God was nearest to me. When I’m hard pressed from all sides and when I’m about to give up, God is right there encouraging us not to give up. When I’m totally lost, that’s when God finds us. When we are lost, we can meet God who searches for the lost. We feel that God is very close when everything goes alright, but when everything goes wrong, we feel that God is far away, but that’s just our feeling. When everything goes wrong, God is right there. St Paul confessed in this way. “We are hard pressed on every side, but not crushed. Perplexed, but not in despair. Persecuted but not abandoned. Struck down, but not destroyed.” The reason he was not in despair, not abandoned and not destroyed was because he met God who was right there with him. We need to learn to recognize to search God when we go through a hard time. When you’re about to give up, God does not give up on you. When you fail, God does not fail you. When you’re scared, God holds you in his arms. You don’t always have good times. We can’t demand that we should always have a good time. We cannot even demand that. It doesn’t matter what age you may be. Sometimes life’s tragedy hits us. Just last week I visited a hospital, and I saw a young woman going through a hard time. We never expect that, but things happen, even bad things can happen. But remember, when you lose God, God finds you. When you lose God, don’t worry too much because God will find you. No matter what you’re going through, God is actively searching for you and ultimately finds you. When you face problems, don’t try to just overcome those problems or deal with those problems or solve them. In those problems meet God, who’s searching for you actively. I realized that just because you solve one problem, that doesn’t mean that another problem won’t come. I realized that problems comes one after another. But when you meet our searching God, you will be able to handle the problems that come to you. They will not scare you and intimidate you. Understand our God who finds you.